Palestinian prisoners announced their next steps of escalation as Bilal Kayed entered his 25th day of hunger strike on Saturday, 9 July amid an international mobilization for his release. Kayed, 35, has been on hunger strike since 15 June; he was scheduled to be released after 14.5 years in Israeli prison on 13 June. Instead of being released, however, he was transferred to administrative detention without charge or trial for six months. Administrative detention orders are indefinitely renewable, and issued without charge or trial on the basis of secret evidence. Kayed is among approximately 750 Palestinians currently held in administrative detention. Alongside Kayed’s strike, his imprisoned comrades in the Popular Front for the Liberation of Palestine and fellow prisoners across political lines have joined in a series of escalating protest actions demanding Kayed’s freedom. Kayed is currently held in solitary confinement in Ashkelon prison, in a small room with no ventilation; he has been denied even a fan. Hundreds of prisoners have been involved in the limited-term hunger strikes in solidarity with Kayed, and have been denied family visits and recreation, and leaders transferred between prisons in retaliation by the Israeli prison administration. Protests have been taking place throughout Palestine and internationally for Kayed’s release. On Friday, 8 July – as an international week of action in support of Kayed began with protests in New York City; Tampa; Arklow, Ireland; Naples, Italy; and London began – fellow prisoners announced their next steps of escalation. “In the context of the battle for freedom, the prisoners of the Front are declaring a new series of steps of protest of a tactical character, beginning as of Friday July 8, to keep the pressure on the Israeli prison administration to unconditionally release Comrade Bilal Kayed, including hunger strike on specific days announced below, as well as other meal returns and protests, up to the strategic step of open collective hunger strike which will be pursued if the prison administration does not respond to their demands. The meals of the prisoners of the Front will be returned on the following days in July: 8 and 9; 11 and 12; 14 and 15; 17 and 18; 20, 21, and 22; 24, 25 and 26; 28, 29, and 30,” said a sixth statement of the prisoners. 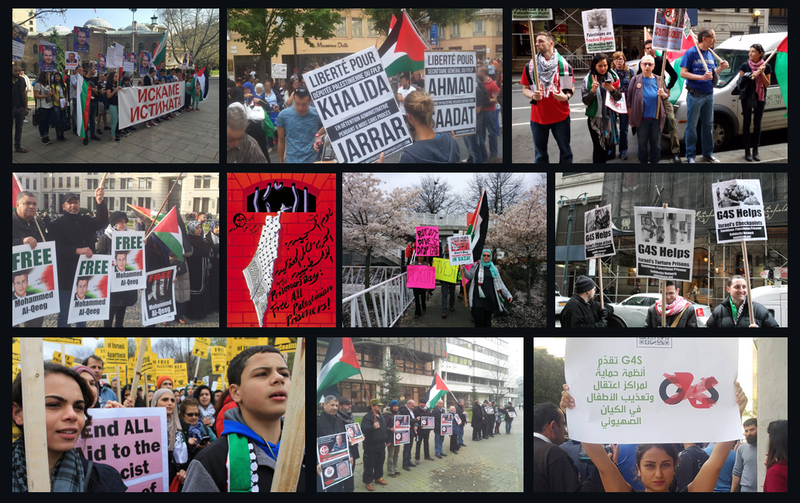 “Similar to the experience of our Palestinian comrades, the United States government silenced and neutralized our own revolutionary movement through incarceration and targeted assassinations during the 60s, 70s, and 80s. A political war has been waged against our communities as a whole, incarcerating millions of our people and victimizing many through police and state abuse. This week in particular, we grieve the further loss of Black lives to extrajudicial killings by the state. We express our solidarity in the midst of immense pain because we understand that these violent acts are not “isolated incidents” for us or Palestinians, but systemic to the US and Israel. In the midst of these wars on our existence, we submit that all of our prisoners are political prisoners, that all Palestinian prisoners are political prisoners, and that we have to fight to liberate everyone by abolishing the cages around us. We stand firm in our solidarity with Bilal Kayed and the over 7,000 Palestinians detained within the Israeli prison system, including more than 750 Palestinians being held without charge or trial. A new issue of the Arabic-language literary magazine Al-Adab was issued on 9 July, dedicated to freedom for Bilal Kayed and imprisoned Lebanese struggler for Palestine Georges Ibrahim Abdallah. Among the pieces in the new issue is a prose writing by Mohammed Khatib of Samidoun Europe, reflecting the thoughts of a Palestinian refugee on Kayed’s case and the Palestinian situation today. Meanwhile, protesters kicked off the week of commemoration for Kanafani and action for Kayed with protests in various cities. In Naples, activists took the streets to urge freedom for Kayed, carrying Palestinian flags and campaign posters and leaflets with information about Kayed’s case and administrative detention. In Tampa, Florida, activists began a solidarity hunger strike to express their support for freedom for Kayed and his fellow Palestinian prisoners. In Arklow, Ireland, socialist Irish republicans gathered to demand freedom for Kayed and mark the 35th anniversary of Irish republican hunger striker’s death in 1981. In New York City, Samidoun Palestinian Prisoner Solidarity Network protested outside the offices of prison contractor and security corporation G4S, demanding freedom for Kayed and an end to G4S’ dealing with the Israeli prison system; while in London, at a rally demanding an end to siege on Gaza on the second anniversary of Israel’s 2014 attack, speakers highlighted the cause of Palestinian prisoners and Kayed’s case. Events will take place demanding freedom for Kayed on Saturday, 9 July in Enniscorthy, Ireland and Manchester; further events will take place throughout the coming week in Beirut, Milan, New York City, and protests and hunger strikes will continue in Tampa.